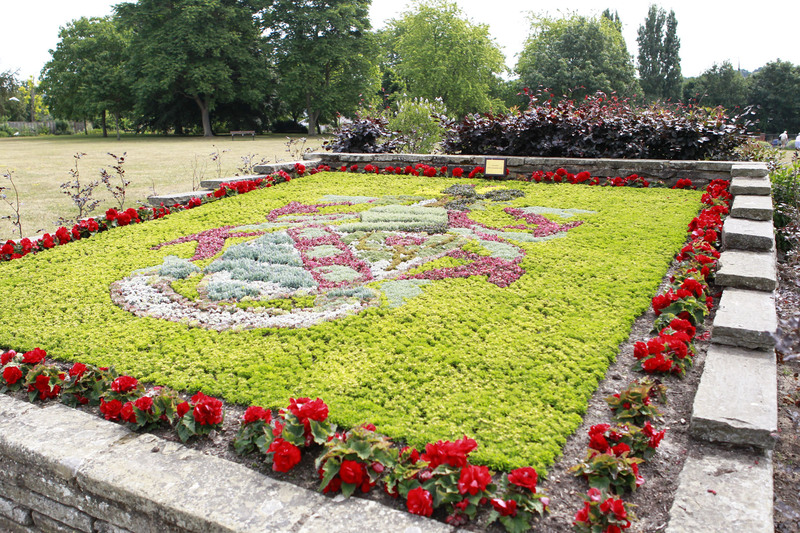 Woodbridge Town Council is very proud to announce that Elmhurst Park in the heart of Woodbridge has again been included in the list of winners of the 2013/2014 Green Flag Award (the national standard for parks and green spaces) announced today by the Keep Britain Tidy Group. This is the TWELTH year running that the has won this award, making it the only directly managed Town Council park in the UK that has won the award this number of times, and the impressive award looks to be unbeaten. The Town Mayor, Councillor Patti Mulcahy, commented that she was delighted that the Park had been included in the list of winners. She said “The renewal of this prestigious award makes Elmhurst one of the top parks in England and Wales. Each year Elmhurst Park is judged against much bigger parks and organisations and this is another impressive win for Woodbridge. I would like to pay tribute to the staff of Eastern Facilities Management Solutions for maintenance of the park. Thanks to Choose Woodbridge and Carl at Ambient Light for these fabulous tours. Earlier today two Anglia in Bloom judges were treated to a jam-packed tour of all the horticultural projects taking place in Woodbridge at the moment. Judges Hazel Law and Julia Rackowe were personally escorted around the town’s horticultural highlights by Councillor Charles Notcutt as well as Chris Harrold and Hana Ballard of Choose Woodbridge. This year’s entry shows off, amongst other projects, the Friends of Fen Meadow’s conservation work with the Suffolk Wildlife Trust to allow the Southern Marsh Orchid to thrive. It also holds up St Mary’s Primary School as a shining example of how a school garden can transform the syllabus into an inclusive horticultural haven – helping to put subjects into context, encourage students out into the fresh air and ensure a good understanding of where food comes from and how it’s cultivated. The tour also included the superb allotments on Kingston Field, the carpet bedding in Elmhurst Park, the Elmhurst Kitchen Garden and the beautifully kept shared garden at Wilding Court and much more besides. Just a little one to remind you all of the wonderful array of parks and public spaces in Woodbridge including; Elmhurst Park, Kingston Field, Fitzgerald Green, Castle Street Park, Broom Heath, Fen Meadow and more! The local press get behind us for this year’s competition! 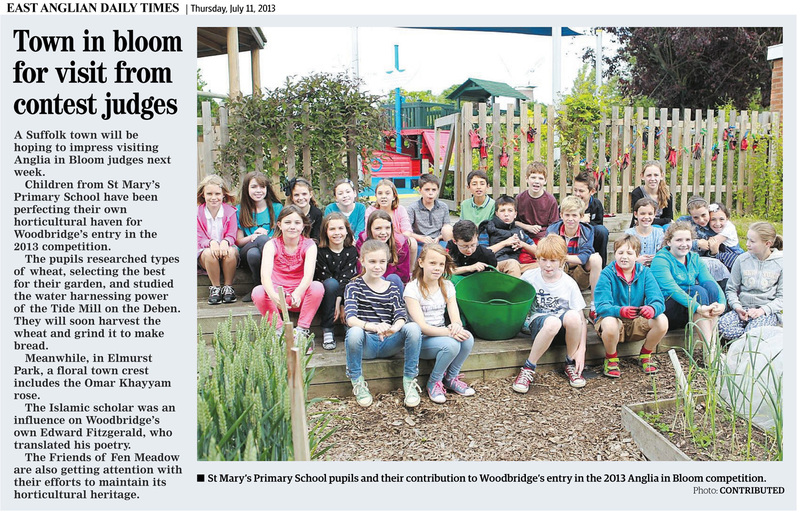 Nice of the EADT to show their support for this year’s Anglia in Bloom submission. Fingers crossed that the judges are impressed when they visit next week!! It’s taken weeks to pull together and barely touches the surface of all we’ve achieved over the past 12 months but here it is for your pleasure and delectation. Friends of Fen Meadow – This new group (2012) is working with the Town Council and Wildlife Trust to bring conservation to Fen Meadow. They have already got designated conservation and biodiverse areas where they are growing Southern Marsh Orchids and other wild flowers with great success.